2. A user of the Website or App (“you” or “User”). This Agreement applies to all services made available by Shija Hospitals on the Website or App. The Services may change from time to time, at the sole discretion of Shija Hospitals, and the Agreement will apply to your visit to and your use of the Website or App to avail the Service, as well as to all information provided by you on the Website or App at any given point in time. This Agreement defines the terms and conditions under which you are allowed to use the Website and App and describes the manner in which we shall treat your account while you are registered as a member with us. If you have any questions about any part of the Agreement, feel free to contact us at contact@shijahospitals.com. Technology (Reasonable Security Practices and Procedures and Sensitive Personal Information) Rules, 2011 (the “SPI Rules”), and the (Indian) Information Technology (Intermediaries Guidelines) Rules, 2011 (the “IG Rules”). You must be 18 years of age or older to register, use the Services, or visit or use the Website in any manner. By registering, visiting and using the Website or accepting this Agreement, you represent and warrant to Shija Hospitals that you are 18 years of age or older, and that you have the right, authority and capacity to use the Website and the Services available through the Website, and agree to and abide by this Agreement. 2. Shija Hospitals and its Partners may by the Services, collect information relating to the devices through which you access the Website, location from which you access and anonymous data of your usage. The collected information will be used only for improving the quality of the Services and to build new services. 3. The Website and App allows Shija Hospitals and its Partners to have access to Users’ personal email or phone number, for the purpose of communication and analytics. 4. Other information mandated by the SPI Rules. 5. the various rights available to such Users in respect of such information. 6. Shija Hospitals and its Partners shall not be responsible in any manner for the authenticity or correctness of the personal information or sensitive personal data or information supplied by the User to Shija Hospitals or to any other person acting on behalf of Shija Hospitals or its Partners. 7. The User is responsible for maintaining the confidentiality of the User’s account access information and password, if the User is registered on the Website or App. The User shall be responsible for all usage of the User’s account and password, whether or not authorized by the User. The User shall immediately notify Shija Hospitals of any actual or suspected unauthorized use of the User’s account or password. Although Shija Hospitals will not be liable for your losses caused by any unauthorized use of your account, you may be liable for the losses of Shija Hospitals or others due to such unauthorized use. 8. If a User provides any information that is untrue, inaccurate, not current or incomplete (or becomes untrue, inaccurate, not current or incomplete), or Shija Hospitals has reasonable grounds to suspect that such information is untrue, inaccurate, not current or incomplete, Shija Hospitals has the right to discontinue the Services to the User at its sole discretion. 10. Shija Hospitals and its Partners may use such information collected from the Users from time to time for the purposes of debugging customer support related issues. 12. User have set Shija Hospitals Apps to access the followings PERMISSIONS on you phone/tablet in order to launch the application sucessfully: (i.) Directly call phone numbers, read phone status and identity, (ii.) Receive text messages(SMS), (iii.) Audio record, change audio setting for notification sound,(iv.) Approximate and precise location for map navigation, (v.) Add or modify calender events for an appointment, (vi.) Read and write login ID number on SD cards, find accounts on the device, (vii.) Full network access to receive data from our server at Internet, and (viii.) Prevent phone/tablet from sleeping. If one of the above permission is disable to access, the Android Application will not work/launch properly. So, Users have to grand the permissions to access, otherwise Shija Hospitals Apps will stopped working to your device, unfortunately. 1. This facility is only enabled or created for you after you have signed up and explicitly accepted these Terms. 1. Patient-created: Information generated and uploaded by you. 2. Shija Hospitals-created: Information generated by your consuming a medical service in a Shija Hospitals hospital like consult, diagnostic test, admission, etc. 3. Any Shija Hospitals-created information is provided on an as-is basis and Shija Hospitals makes no representation in connection therewith. 4. The accuracy, adequacy, reliability and liability of any Patient-created information generated or created by a User is the sole responsibility of the User. You fully indemnify and hold harmless Shija Hospitals and its Partners with respect to any inaccuracies, inadequacy, error, loss, problem, liability or any other issue arising out of any Patient-created information entered or accessed by the You or on your behalf on the Website or App. 5. The personal health record facility is provided on a best-efforts as-is basis. While we strive to maintain the highest levels of service availability, Shija Hospitals or its Partners are not liable for any interruption that may be caused to your access of the Services. 6. Any health related reminder or notification service (like medication reminder, appointment reminder, etc.) that may form part of the Services is only a supplementary way of notifying or reminding you of actions to take related to your health. Shija Hospitals is not liable if for any reason a reminder or notification is not delivered to you or are delivered late or delivered incorrectly, despite its best efforts or if your health is impacted negatively due to the same. 7. Shija Hospitals uses industry–level security and encryption to your personal health record. However, Shija Hospitals cannot guarantee prevention of unauthorized access if you lose your login credentials or they are otherwise compromised. Please safeguard your login credentials and report any actual suspected breach of account to contact@shijahospitals.com. 8. If you access your dependents’ record through your personal health record by registering your dependents with your own personal health record, you are deemed to be responsible for the records of your dependents and all obligations that your dependent’s would have had had they maintained their own separate individual personal health record. 9. If you provide anyone else access to your personal health record, you are deemed to be responsible for all actions, access, transaction that that person takes related to your personal health record either on their own or independently. Shija Hospitals or its Partners are not responsible or liable for any action, transaction, loss, leakage or any other liability arising out of this. 1. Shija Hospitals collects, directly or indirectly, and displays on the Website, relevant information regarding the profile and practice of the Practitioners listed on the Website, such as their specialisation, qualification, fees, location, visiting hours, and similar details. Shija Hospitals takes reasonable efforts to ensure that such information is updated at frequent intervals. Shija Hospitals cannot be held liable for any inaccuracies or incompleteness represented from it, despite such reasonable efforts. 2. The Services provided by Shija Hospitals or any of its licensors or Partners are provided on an “as is” and “as available’ basis, and without any warranties or conditions (express or implied, including the implied warranties of merchantability, accuracy, fitness for a particular purpose, title and non-infringement, arising by statute or otherwise in law or from a course of dealing or usage or trade). Shija Hospitals and its Partners do not provide or make any representation, warranty or guarantee, express or implied about the Website, App or the Services. Shija Hospitals and its Partners do not guarantee the accuracy or completeness of any content or information provided by Users on the Website. To the fullest extent permitted by law, Shija Hospitals and its Partners disclaim all liability arising out of the User’s use or reliance upon the Website, App, the Services, representations and warranties made by other Users, the content or information provided by the Users on the Website, or any opinion or suggestion given or expressed by Shija Hospitals or its Partners or any User in relation to any User or services provided by such User. 3. The Website or App may be linked to the website of third parties, affiliates and business partners. Shija Hospitals has no control over, and not liable or responsible for content, accuracy, validity, reliability, quality of such websites or made available by/through our Website or App. Inclusion of any link on the Website or App does not imply that Shija Hospitals endorses the linked site. User may use the links and these services at User’s own risk. 4. Shija Hospitals and its Partners assume no responsibility, and shall not be liable for, any damages to, or viruses that may infect User’s equipment on account of User’s access to, use of, or browsing the Website or App or the downloading of any material, data, text, images, video content, or audio content from the Website or App. If a User is dissatisfied with the Website or App, User’s sole remedy is to discontinue using the Website or App. 5. If Shija Hospitals determines through feedback or otherwise that you have provided fraudulent, inaccurate, incomplete or false information, Shija Hospitals reserves the right to immediately suspend your access to the Website or any of your accounts with Shija Hospitals and makes such declaration about suspension on the website alongside your name as determined by Shija Hospitals for the protection of its business and in the interests of Users. You shall be liable to indemnify Shija Hospitals and its Partners for any losses incurred as a result of your misrepresentations or fraudulent feedback that has adversely affected Shija Hospitals, its Partners or its Users. 1. While Shija Hospitals will try to ensure a confirmed appointment with a medical service provider (like doctor or diagnostic lab) for a User who requested an appointment on the Website or App, Shija Hospitals or its Partners do not guarantee that the User will get a confirmed appointment. Further, Shija Hospitals and its Partners have no liability if such an appointment is confirmed but later cancelled, postponed or rescheduled by the hospital or medical service provider, or the medical service provider are not available as per the given appointment time. 3. You understand and agree that any interactions and associated issues with other Users including but not limited to your health issues and your experiences is strictly between you and the other Users. You shall not hold Shija Hospitals or its Partners responsible for any such interactions and associated issues and Shija Hospitals will not be held responsible or liable for the same. For avoidance of doubt, the Services are not to provide any healthcare or medical advice or diagnosis and hence Shija Hospitals and its Partners are not responsible for any medical or other outcomes between you and the medical service providers you interact with, pursuant to any interactions on the Website or App. If you decide to engage with a medical service provider to provide medical services to you, you do so at your own risk. Shija Hospitals or its Partners shall not be responsible for any breach of service or service deficiency by any medical service provider you connect, engage or transact with using the Website or App. We advise you to perform your own investigation or get feedback prior to selecting a doctor or any other service provider available on the Website or App. 4. any medical eventualities that might occur subsequent to using the services of a doctor, diagnostic lab services, pharmacy, whom the User has selected on the basis of the information available on the Website or App or with whom the User has booked an appointment or performed a transaction through the Website or App. 5. Further, Shija Hospitals shall not be liable, under any event, for any comments or feedback given by any of the Users in relation to the services provided by another User. All such feedback should be made in accordance with applicable law. The option of Users to give feedback remains at Shija Hospitals’s sole discretion and may be modified or withdrawn at its sole discretion. Shija Hospitals may moderate such feedback at any time. Shija Hospitals shall not be obliged to act in any manner to give effect to the content of Users’ feedback. 1. The Website and App provide you the ability to pay online through a third party payment gateway for some of the Services available on the Website or App. 1. Some of the content, text, data, graphics, images, information, suggestions, guidance, and other material (collectively, “Information”) that may be available on the Website (including information provided in direct response to your questions or postings) may be provided by individuals in the medical profession. The provision of such Information does not create a licensed medical professional/patient relationship, between Shija Hospitals and you and does not constitute an opinion, medical advice, or diagnosis or treatment of any particular condition, but is only provided to assist you with locating appropriate medical care from a qualified practitioner. 2. It is hereby expressly clarified that, the Information that you obtain or receive from Shija Hospitals, and its employees, contractors, partners, sponsors, advertisers, licensors or otherwise on the Website is for informational purposes only. In no event shall Shija Hospitals be liable to you or anyone else for any decision made or action taken by you in reliance on such information. 3. The Services are not intended to be a substitute for getting in touch with emergency healthcare. If you are an User facing a medical emergency (either on your or a another person’s behalf), please contact an ambulance service, hospital, doctor or appropriate medical professional directly. 2. Belong to Shija Hospitals and its Partners. 3. The information that is collected by Shija Hospitals directly or indirectly from the Users shall belong to Shija Hospitals and its Partners. Copying of the copyrighted content published by Shija Hospitals or its Partners on the Website for any commercial purpose or for the purpose of earning profit will be a violation of copyright and Shija Hospitals and its Partners reserve their rights to take action under applicable law accordingly. 2. Shija Hospitals authorizes the User to view and access the content available on or from the Website solely for ordering, receiving, delivering, sharing, storing and communicating only as per this Agreement. 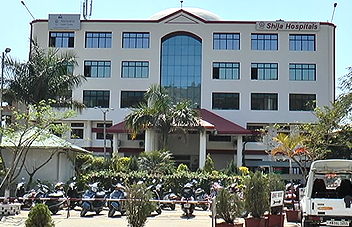 The contents of the Website, App, information, text, graphics, images, logos, button icons, software code, design, and the collection, arrangement and assembly of content on the Website (collectively, “Shija Hospitals Content”), are the property of Shija Hospitals or its Partners and are protected under copyright, trademark and other applicable laws. User shall not modify the Shija Hospitals Content or reproduce, display, publicly perform, distribute, or otherwise use the Shija Hospitals Content in any way for any public or commercial purpose or for personal gain. 3. User shall not access the Services for purposes of monitoring their availability, performance or functionality, or for any other benchmarking or competitive purposes. You are solely responsible for the content that you choose to submit for publication on the Website, including any feedback, ratings, or reviews (“Critical Content”). The role of Shija Hospitals in publishing Critical Content is restricted to that of an ‘intermediary’ under the Information Technology Act, 2000. Shija Hospitals disclaims all responsibility with respect to the content of Critical Content, and its role with respect to such content is restricted to its obligations as an ‘intermediary’ under the said Act. Shija Hospitals shall not be liable to pay any consideration to any User for re-publishing any content across any of its or its Partners platforms. and you agree to provide your fullest co-operation further to such communication by Shija Hospitals. 9. threatens the unity, integrity, defence, security or sovereignty of India, friendly relations with foreign states, or public order or causes incitement to the commission of any cognisable offence or prevents investigation of any offence or is insulting any other nation. 8. framing or hot linking or deep linking any Shija Hospitals Content. 3. Shija Hospitals or its Partners, upon obtaining knowledge by itself or been brought to actual knowledge by an affected person in writing or through email signed with electronic signature about any such information (as mentioned above) generated by Users, or on being notified by the appropriate Government or its agency that the Website or App is being used by the User to commit any unlawful act and/or is being used in violation of Clauses 10.a and 10.b above, shall be entitled to remove or disable access to the material or information that is in contravention of Clause 10. Shija Hospitals is entitled to act, as required by the IG Rules, within thirty six hours of obtaining such knowledge and, where applicable, work with Users to disable such information that is in contravention of applicable law. Shija Hospitals shall also be entitled to preserve such information and associated records for at least 90 (ninety) days for production to governmental authorities for investigation purposes. 5. Shija Hospitals may disclose or transfer User-generated information to its affiliates or governmental authorities in such manner as permitted or required by applicable law, and you hereby consent to such transfer. Shija Hospitals will comply with any duly-issued government or court directions to disable access to the User-generated information, should it be found to be illegal by a competent governmental authority. 1. The contents of the Website and App are protected by intellectual property laws of India including without limitation to trademark and copyright laws. Reproduction, retransmission, public and/or commercial use of any or all the material on the Website and App are prohibited. The logos, service marks and trademarks (“IP Marks”) displayed on the Website or App are the property of Shija Hospitals or its Partners or have been licensed to Shija Hospitals or its Partners by the relevant owners for use. The User may use this material only as expressly authorized by Shija Hospitals or its Partners and shall not copy, transmit or create derivative works of such material without express authorization from Shija Hospitals or its Partners. 2. The User acknowledges and agrees that they shall not upload, post, reproduce or distribute any content on or through the Website or App that is protected by copyright or other proprietary right of a third party, without obtaining the permission of the owner of such right. Any copyrighted or other proprietary content distributed on or through the Website or App with the consent of the owner must contain the appropriate copyright or other proprietary rights notice. The unauthorized submission or distribution of copyrighted or other proprietary content is illegal and could subject the User to personal liability or criminal prosecution. Nothing on the Website or App should be construed as granting, by implication, estoppels, or otherwise, any license or right to use any trademarks without written permission from Shija Hospitals. 5. Shija Hospitals believes in its sole discretion that User’s actions may cause legal liability for such User, other Users or for Shija Hospitals or its Partners or are contrary to the interests of the Website. 2. Once temporarily suspended, indefinitely suspended or terminated, the User may not continue to use the Website under the same account, a different account or re-register under a new account. On termination of an account due to the reasons mentioned herein, such User shall no longer have access to data, messages, files and other material kept on the Website by such User. The User shall ensure that he/she/it has continuous backup of any medical services the User has rendered in order to comply with the User’s record keeping process and practices. 2. The Information does not constitute an invitation or recommendation to take medical services from Shija Hospitals or its Partners nor is such Information a substitute for professional advice or solicitation in respect of medical services/ products or recommendation thereof. Shija Hospitals urges the Users to seek the advice of professionals, as appropriate, regarding the evaluation of any specific opinion, advice, product, service, or other Information. 3. All information on the Website is provided to you “as is” without warranty of any kind either express or implied including, but not limited to implied warranties of merchantability and fitness for a particular purpose, title, non-infringement, security or accuracy. In no event shall Shija Hospitals or its Partners be liable for any special, direct, indirect or consequential damages or any damages whatsoever resulting from loss, whether in an action of contract, negligence or other tortuous action, arising out of or in connection with the use or performance of information. All information available on a hyper-link site and any third party is subject to the terms and conditions of the legal notices contained therein. 1. The information available on the Website or App could include inaccuracies or typographic errors. Shija Hospitals has endeavored to ensure that all the information on the Website is correct, but Shija Hospitals neither warrants nor makes any representations regarding the quality, accuracy or completeness of any data or information contained. Shija Hospitals makes no warranty, express or implied, concerning the website or App and/or its contents and disclaims all warranties of fitness for a particular purpose and warranties of merchantability in respect of Services, including any liability, responsibility or any other claim, whatsoever, in respect of any loss, whether direct or consequential, to any user or any other person, arising out of or from the use of the information contained in the website. 2. In no event shall Shija Hospitals or its Partners be liable for any direct, indirect, punitive, incidental, special, consequential damages or any other damages resulting from: (a) the use or the inability to use the Services; (b) unauthorized access to or alteration of the User’s transmissions or data; (c) any other matter relating to the services; including, without limitation, damages for loss of use, data or profits, arising out of or in any way connected with the use or performance of the website. Neither shall the Company be responsible for the delay or inability to use the Website, App, Services or any related services, the provision of or failure to provide services, or for any information, software, products, services and related graphics obtained through the Website or App, or otherwise arising out of the use of the Website or App, whether based on contract, tort, negligence, strict liability or otherwise. Further, Shija Hospitals shall not be held responsible for non-availability or access to the Website or App during periodic maintenance operations or any unplanned suspension of access to the Website that may occur due to technical reasons or for any reason beyond Shija Hospitals control. The user understands and agrees that any material and/or data downloaded or otherwise obtained through the website is done entirely at his/her own discretion and risk and the User himself/herself will be solely responsible for any damage to their computer systems or loss of data that results from the download of such material and/or data. These limitations, disclaimer of warranties and exclusions apply without regard to whether the damages arise from (a) breach of contract, (b) breach of warranty, (c) negligence, or (d) any other cause of action, to the extent such exclusion and limitations are not prohibited by applicable law. User agrees to indemnify and hold harmless Shija Hospitals, its affiliates, officers, directors, employees, consultants, licensors, agents, representatives and Partners from any and all third party claims, losses, liability, damages, and/or costs (including reasonable attorney fees and costs) arising from User’s access to or use of Service, violation of this Agreement, or infringement, or infringement by any other User of his/her/its account, of any intellectual property or other right of any person or entity. Shija Hospitals will notify you promptly of any such claim, loss, liability, or demand, and in addition to your foregoing obligations, you agree to provide us with reasonable assistance, at your expense, in defending any such claim, loss, liability, damage, or cost. 1. You agree that this Agreement and any contractual obligation between the Company and User will be governed by the laws of India. 2. Subject to the above Paragraph above, the courts at Imphal shall have exclusive jurisdiction over any disputes arising out of or in relation to this Agreement, your use of the Website or the Services or the information to which it gives access. 1. If a User has any questions concerning the Company, the Website or App, this Agreement, the Services, or anything related to any of the foregoing, please write to us at contact@shijahospitals.com. No provision of this Agreement shall be deemed to be waived and no breach excused, unless such waiver or consent shall be in writing and signed by Shija Hospitals. Any consent by Shija Hospitals to, or a waiver by Shija Hospitals of any breach by you, whether expressed or implied, shall not constitute consent to, waiver of, or excuse for any other different or subsequent breach.